FOSEL and its various board members have maintained and improved the physical appearances of the library and the park, and raised funds for its popular programming. Marleen Nienhuis (president); Barbara Sommerfeld (treasurer); Kim Clark (clerk); Gary Bailey; Marilyn Davillier; Maura Harrington; Licia Sky; Duncan Will. The FOSEL advisory board included Nick Altschuller; Liane Crawford; Susanna Coit; Michael Cox; Don Haber; Ed Hostetter; Gail Ide; Stephen Fox; Michelle Laboy; Reinhold Mahler; Jacqueline McRath; Jon Santiago; Anne Smart; Karen Watson. Marleen Nienhuis (president); Barbara Sommerfeld (treasurer); Ed Hostetter (clerk/secretary), serving two-year terms; and directors Marilyn Davilier; Maura Harrington; Jon Santiago; Kim Clark; and Michelle Laboy, serving one-year terms. The FOSEL advisory board included Jacqueline McRath; Stephen Fox; Don Haber; Liane Crawford; Susanna Coit; Lois Russell; Licia Sky; Anne Smart; and Karen Watson. Curtis Seborowski (president); Barbara Sommerfeld (treasurer); Marleen Nienhuis (clerk/secretary); and directors Mari Passananti and Adam Castiglione. 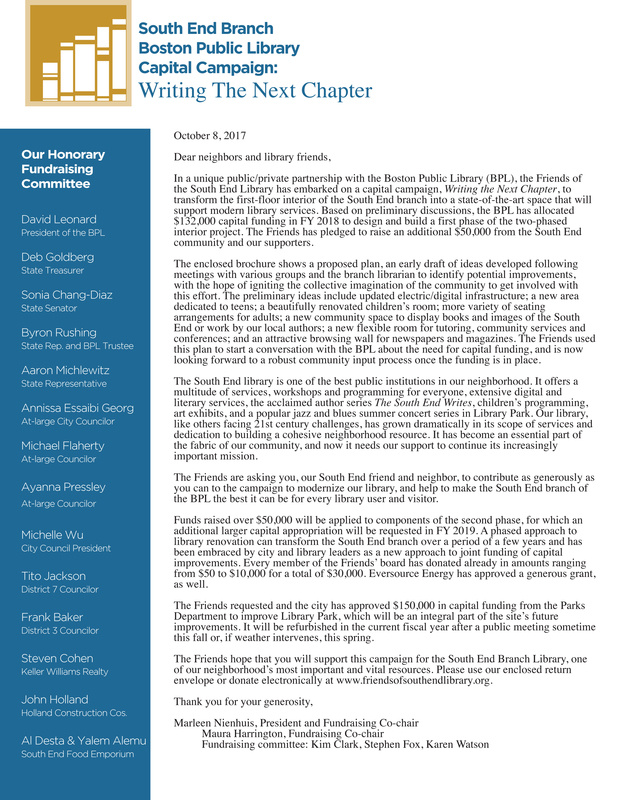 The advisory board included Anne Smart, head librarian of the SE library; Mary Owens, graphic designer; Stephen Fox; chair of the Rutland Square Association, which is the official Parks Department Partner for Library Park; and P.K. Shiu. All are volunteers. Glyn Polson (president); Barbara Sommerfeld (treasurer); Adam Castiglione (clerk); and directors Courtney Fitzgerald, Anita Mercado, Deb Coletti, Rhys Sevier, and P.K. Shiu. Marleen Nienhuis (president); Dana Dubreuil (treasurer); Anthony Woeltz (clerk); Lois Russell (secretary); and directors Ann Wilson Lloyd and Stephen Fox.